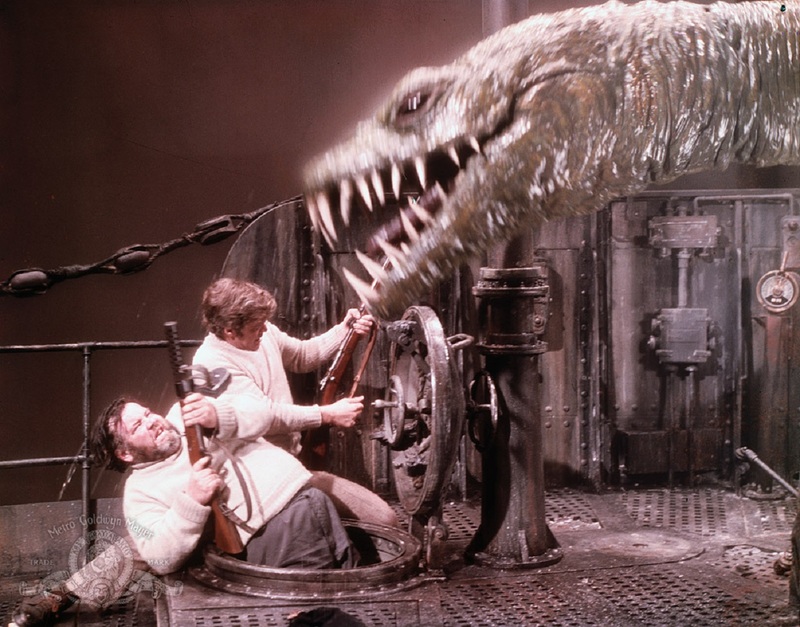 Director – Kevin Connor, Screenplay – James Cawthorn & Michael Moorcock, Based on the Novel by Edgar Rice Burroughs, Producer – John Dark, Photography – Alan Hume, Music – Douglas Gamley, Special Effects – Derek Meddings, Dinosaur Sequences – Roger Dicken, Process Photography – Charles Staffel, Makeup – Tom Smith, Production Design – Maurice Carter. Production Company – Amicus/British Lion. In 1916, the US Montrose is fired on and sunken by a German U-boat. The survivors manage to sneak aboard and capture the U-boat. In between subsequent coups, the British and Germans agree to an uneasy truce until they reach a neutral port. However, they become lost and instead find land on the mythical continent of Caprona where dinosaurs and cavemen still roam. Amid this savage, primitive environment, they attempt to survive and repair the submarine. The Land That Time Forgot was the first of a series of period lost world adventures from the team of director Kevin Connor, producer John Dark and star Doug McClure, all of which usually took Edgar Rice Burroughs as inspiration. The other entries were At the Earth’s Core (1976), The People That Time Forgot (1977), a direct sequel to this, and the non-Burroughs-based Warlords of Atlantis (1978). The tetraology has always been criticised for its cheap spectacle and infamous dinosaurs on wires. Contrarily, that is much of the appeal of the series and the series’ more B-budget shortcomings have been overstressed by the genre’s less tolerant. If anything, these failings are a mirroring of the crude vigour of the original Edgar Rice Burroughs stories – in the same sense that the films are technically deficient, so too was Burroughs’ writing and characterisation, but both also often contain flights of imagination that transcended their technical imperfections. The Land That Time Forgot works rather well. For the low level the film seems to have been received on, the expected spectacle and action of the genre is balanced out with a surprising intelligence. The script is co-written by celebrated sf/fantasy author Michael Moorcock – see The Final Programme (1974) for Moorcock’s one other film adaptation). If anything, Moorcock improves on Edgar Rice Burroughs’ book, which was published in 1918, adding a fascinating series of biological speculations that see Caprona as a land of bountiful co-existent evolution. The early scenes aboard the submarine are good too – the skulking about, backstabbing and the uneasy deal eventually achieved – is conducted with considerable drama and suspense, even characterisation. Indeed, the Germans give the best performances in the film – Anthony Ainley (later the third incarnation of The Master on the Doctor Who (1963-89) tv series) who positively relishes all the sneering double-dealing nastiness, and John McEnery (despite being overdubbed by Anton Diffring) making the German captain surprisingly sympathetic and likeable. Representation from the British side is eminently forgettable – Susan Penhaligon is extremely cute but hardly convinces she is a biologist. 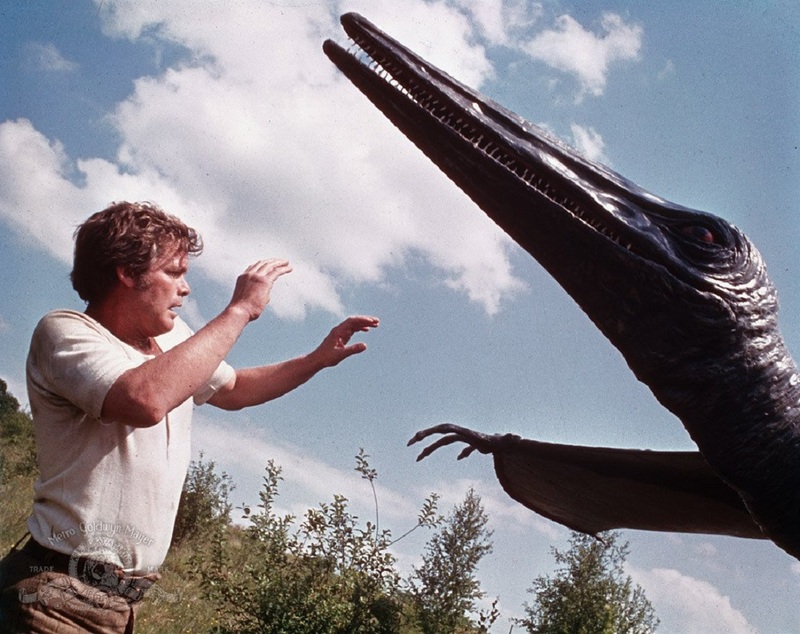 Doug McClure wades in as the resolute, square-jawed man of decision that he sustained as a wooden single-note characterisation through the subsequent three films in the series. The special effects are not that bad. The submarine scenes suffer from the inevitable problems that model water effects do but are otherwise convincing. The dinosaur scenes are at times awkward, at others passable. The effects team have set out to create a colourful lost world spectacle and have succeeded – the first vision we get of Caprona as a smoking volcano on the horizon backlit by flashing skies, with circling pterodactyls and a brontosaurus grazing above a waterfall is one moment of great wondrousness. The same Edgar Rice Burroughs story was later remade by the low-budget US company The Asylum as The Land That Time Forgot (2009) directed by and starring C. Thomas Howell. Kevin Connor’s other genre films, aside from the aforementioned lost world adventures, include the fine horror anthology From Beyond the Grave (1974); the Arabian Nights fantasy Arabian Adventure (1979); the cannibalism black comedy Motel Hell (1980); and the ghost story The House Where Evil Dwells (1982). These days Connor directs for tv, making such unexceptional soap opera fare as Mistral’s Daughter (1984), Diana: Her True Story (1993), Liz: The Elizabeth Taylor Story (1995), Mother Teresa: In the Name of God’s Poor (1997) and Mary, Mother of Jesus (1999). Among Connor’s genre tv fare is:- Goliath Awaits (1981), an interesting tv mini-series about a society that has survived in a sunken ship; The Return of Sherlock Holmes (1987), which brought the famous sleuth into the present-day; the Indian adventure The Mysteries of the Dark Jungle (1991); the stalker thriller Shadow of Obsession (1994); the Egyptian archaeology adventure The Seventh Scroll (1999); the Christmas fantasies Santa, Jr. (2002), A Boyfriend for Christmas (2004), Farewell Mr Kringle (2010) and Annie Claus is Coming to Town (2011); the Hallmark adaptation of Frankenstein (2004); and Chasing Leprechauns (2012).